Discussion in 'Acquistion Targets' started by zuolun, Dec 26, 2012. I thought H & S pattern is usually very clear one.... like this. STI has a complex H&S chart pattern similar to Toyota's chart dated 28 May 2010 (see below). 1. The initial bearish signal was a long black marubozu with extremely high vol. which appeared on 23 May 2013. 2. A mini-bear flag was broken convincingly with a long black marubozu closing @ 3367.47 (-38.61, -1.1%) on 29 May 2013. 3. On 30 May 2013, STI closed with a long-tailed hammer @ 3336.01 (-31.46, -0.93%) indicating that a short-term technical rebound is imminent. If 3300 breaks, where is the next strong support? STI has a hammer @ 3317.17 (-50.3, -1.5%) on 30 May 2013 at 11.35am. Immediate resistance @ 3322, immediate support @ 3300, next support @ 3270, strong support @ 3181, the 200d SMA. According to the 2013 Bradley Turn Dates; the market is bullish until 22nd Jun 2013 then it starts to plunge. However, it appears that the market starts to plunge one month early starting from today Thursday 23rd May 2013. Healthway's chart pattern is similar to GuocoLeisure; its crucial resistance is @ 0.121. It means a bullish breakout convincingly above 0.121 with extremely high vol. is a decisive/confirmed BUY signal; an unconfirmed chart pattern has no further meaning. Stocks that exhibit certain chart patterns (Cup and Handle, Double Bottom and Flat Base) can lead to strong price appreciation when they breakout on strong volume. GuocoLeisure closed with a white marubozu @ 0.955 (+0.08, +9.1%) on 23 Apr 2013. Immediate support 0.92, immediate resistance 1.00. The chart patterns showed that they're extremely overbought, except CapitaComm (ref. to the OBV indicator). The 5 uptrend stocks mentioned by nottibird below have identical chart patterns. If you rotate these charts upside down, you'll understand why SMM's share price is going down and down the longkang although it's extremely oversold. The reverse is true for SuntecREIT, CapitaComm, Starhub, Ezion Holdings and ST Engineering, which are extremely overbought yet their share prices are going up and up non-stop. It's the same logic why the Singapore residential property prices (pte & HDB) rocketed sky-high non-stop. I beg to differ. The gap bet. 1.71 & 1.74 created an island bottom. Olam should rebound to 1.74 and above 1st b4 it continues its downward movement. Olam closed with a black marubozu @ 1.67 (-0.035, -2.1%) on 4 Apr 2013. Olam rebounded to close the gap bet. 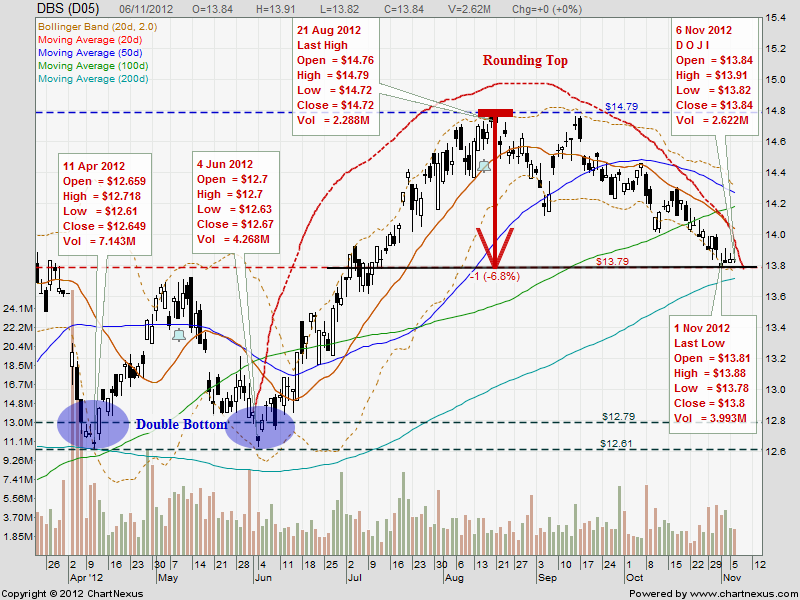 1.71 & 1.74 on 21 Mar 2012 but downtrend prevails. Olam closed with a spinning top @ 1.74 (+0.025, +1.5%) on 21 Mar 2013. Immediate resistance 1.77, immediate support 1.71. The gap bet. 1.71 & 1.74 created an island bottom on 19 Nov 2012 was covered yesterday 21 Mar 2012. Innopac hit low of 0.198 high of 0.21 trading 0.198/0.199 now @ 0.199 (-0.006, -2.9%) vol. done at 114.42m shares on 3 Apr 2013 at 0455 hrs. The Bearish Gravestone Doji is a strong and powerful single candlestick pattern which clearly indicates that a short-term bearish trend reversal is imminent. Innopac closed unchanged with a gravestone doji @ 0.205 on 2 Apr 2013. Immediate support @ 0.205, strong resistance @ 0.22. I was tricked by the CK in ChinaMinZhong (stock already collected for a long period of time) on 25 Sep 2012, closing with a gravestone doji. Still holding on to my Interra Resources bot at 0.455 and 0.46. Not adding any more positions liao. Interra is trading in an upward sloping channel. 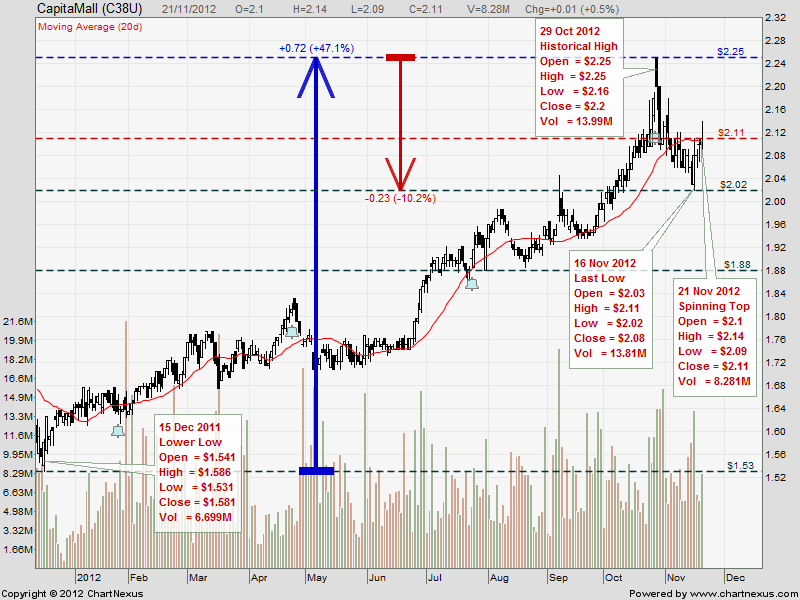 It had hit the bottom @ 0.11 on 3 Jan 2012 and broke its long-term downtrend @ 0.15 on 30 Jan 2012. The article and chart below (in Chinese language) is to share with you the similar chart & price action pattern, relevant to Interra. If you couldn't understand Chinese, please don't ask me to translate in English; it's beyond my ability. 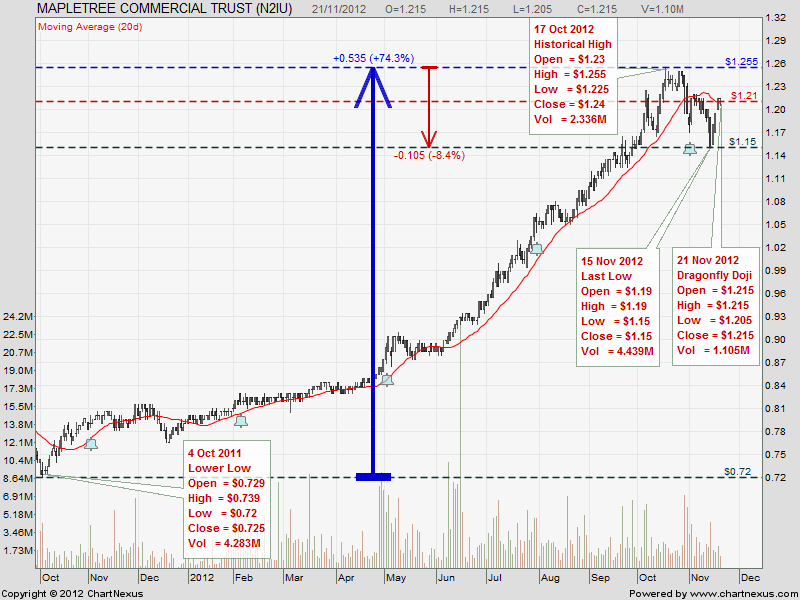 JB Foods closed unchanged with a hammer @ 0.435 on 26 Mar 2013. Immediate resistance 0.455 immediate support 0.425. On the 7 Sep 2012, I posted JB Foods' chart and commented that it's range-bound; forming a base, exactly the same comments which I had posted here. I also followed-up with a screenshot when I had detected a 1-lotter done @ 0.285 (CK checking for counterparties) during lunch time. xfactor retaliated and posted his -ve views without any charts or FA to substantiate. I didn't want to argue further with him, in case he accused me again that I was stuck in JB Foods and was trying to promote the stock to forumers. 1. Based on volume, the selling has dried up as JB Foods's free-float is limited. 2. The stock should be supported by the 1c dividend. 3. As long as 0.285 is not broken, the upside is more than the downside. 4. 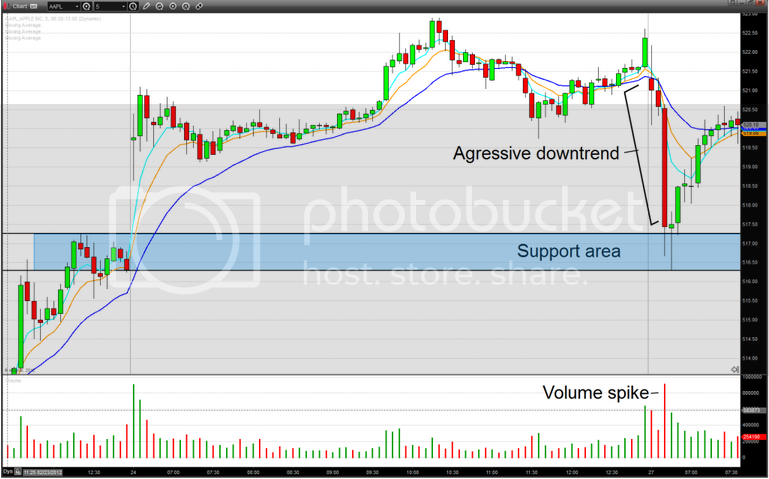 I saw a double bottom last week and today when I updated my JB Foods chart, I saw a SAUCER formation. 5. I don't mind to get in when the price hits above 0.32, i.e. only after confirmation of a Bullish Bollinger Bands breakout with high volume. Those vested and cut-loss on JB Foods last Thursday would have lost money as the stock closed with a hammer @ 0.31 today. (Last Friday's closing with a white candle @ 0.305 was bullish.) . This post is specially posted for the HUGE housefly to inform him that I would never subject myself to Groupthink when my own money is concerned. Interra closed with a white marubozu @ 0.465 (+0.015, +3.3%) on 25 Mar 2013. Immediate support 0.445, immediate resistance 0.465. Interra closed with a white marubozu @ 0.45 (+0.005, +1.1%) on 22 Mar 2013. A +ve EOD closing @ 0.465 is a confirmation of a bullish morning doji star reversal, today 25 Mar 2013. The best joke was that, when I posted a picture of a bullish morning star pattern together with UMS's chart dated 16 May, specially directed at x-factor then, he continued his argument saying, "one swallow doesn't make a summer" -- meaning MUST WAIT FOR FURTHER CONFIRMATION. (Obviously he doesn't understand that a bullish morning star pattern is equivalent to a bearish evening star pattern -- meaning the reliability is high.) On 16 May 2012, I bought 100 lots of UMS @ 0.345 because I always like to bet on Exhaustive Gap. In short, x-factor made a fool of himself in Sep saying he had no vested interest in UMS only revealed his pathetic ego. ==> When wronged; die die must argue that he is right! ZL bro care to TA UOB? My personal opinion on UOB is that, it will break the S$20 resistance. If the resistance is taken out; interim TP S$21.65, next TP S$22.25. 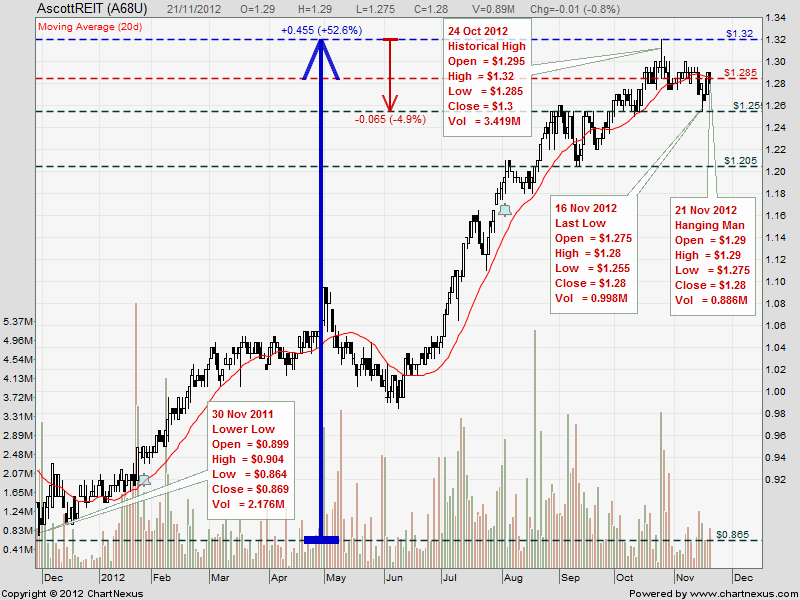 UOB has all the 4 MAs pointing up (bullish), CIMB has all the 4 MAs pointing down (bearish) + a Dead Cross. Many attempts have been made to break the resistance @ 20.00, I was told if you keep poking the ceiling over a period of time, one fine day it will sure be poked through. UOB closed with a a bearish engulfing pattern @ 19.77 (-0.16, -0.8%) on 22 Mar 2013. 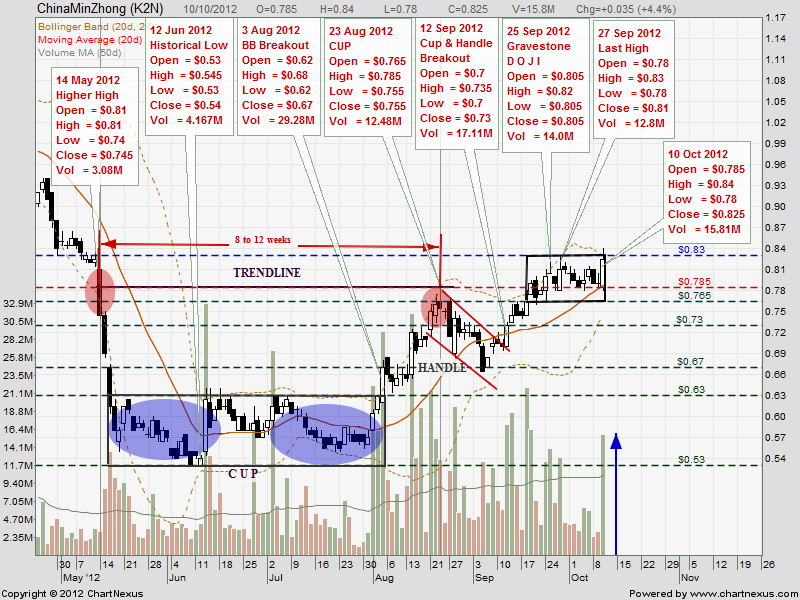 Immediate support @ 19.60, strong resistance @ 20.00. UOB closed with a spinning top @ 19.90 (+0.19, +1%) on 15 Mar 2013. Immediate support @ 19.50, strong resistance @ 20.00. THE rally in penny stocks that has taken many to record highs this year came to a crashing halt yesterday with a trader referring to the selldown as a "burst bubble". Many shares that have shot up despite the firms not having impressive fundamentals were dumped amid a relatively weak market and fresh trading curbs that were imposed by some brokerages. One stock, WE Holdings, lost 47 per cent. Others were down by as much as 20 per cent while the FTSE ST Catalist Index, which tracks 109 counters, mostly penny stocks, lost 5 per cent. The FTSE Fledgling Index, which reflects the value of the bottom 2 per cent of stocks by market capitalisation, fell nearly 2 per cent. Both these indices have risen about 14 per cent this year, far outpacing the benchmark Straits Times Index's 4 per cent rise. Retail investors who chased these stocks on the herd mentality are probably the biggest losers. "Retail investors lost quite a bit of money today. The lesson is that it is never in their interest to chase a stock that is trading way above its book value," said remisier Alvin Yong. Yesterday's decline only underscored a trend that has been in motion over recent weeks. "It's not really unusual as most of the recently active penny stocks have started to slow down after a considerable run," said another remisier. Realisation may have also set in that some of these shares were at levels well above their true value. "The bubble has burst. Some of these counters were trading way ahead of their fundamentals with lofty expectations. There is a sense of reality that has hit investors that the shares have run ahead of the developments," said Mr Yong. Myanmar plays topped the hit list yesterday. The steepest decline was felt by Catalist-listed WE Holdings, which was chased up recently on news of a potential tie-up and business venture in the new land of opportunities. The counter reached a high of 18.4 cents on Feb 26. But it plunged six cents or 47 per cent to 6.8 cents yesterday, on trade of 410 million shares worth $39 million, the day's most active stock. Another Myanmar play, Aussino Group, lost 2.2 cents or 12 per cent to 16.7 cents. Last year, the lifestyle product supplier was a subject of a reverse takeover led by a prominent Myanmar businessman to mark its shift into the country's budding energy sector. That helped the counter hit a high of 29 cents on Jan 31. The corporate development is still in limbo and faces regulatory risk. The maker of bedlinen and towels has been suffering losses since 2008 and was placed on the Singapore Exchange watch-list in 2011. "There have been no updates on the deal and the company has yet to turn around. But it's already trading like a profitable firm," a dealer pointed out. Ntegrator International shed two cents or 19 per cent to 8.4 cents. The communications network firm said in January that it secured $12 million in new contracts. Investor favourite Yoma Strategic also came under selling pressure, falling 7.5 cents or 9 per cent to 75.5 cents. "When these micro stocks fall, they fall very fast. Retail investors are not that nimble to get out and fear grips them. So, some of these counters will have few buyers which precipitates the fall," said remisier Ernest Lim. The sharp fall in some of these counters could have also been a result of trading curbs from stockbroking houses that require more cash upfront so they can limit their exposure to a single counter. Broker UOB Kay Hian has imposed restricted online trading on 15 stocks, including WE Holdings, according to its website. 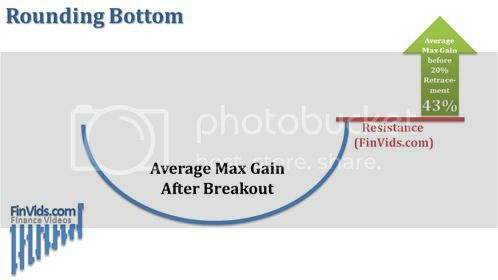 A bottom reversal is only possible AFTER a downtrend. Most of the patterns need a confirmation. A confirmation must appear one up to three candles after the pattern. This confirmation is a big white candle, high volume with the new up-move, a rising window, or breaking a resistance. A reversal pattern during price reaction must be considered a continuation pattern. For the best result, you must combine candlestick patterns with Western technical analysis. An unconfirmed pattern has no further meaning. ZELAN closed with a black marubozu @ 0.295 (-0.04, -11.9%) on 22 Mar 2013. Immediate support 0.295, immediate resistance 0.345. Thanks Zuolun for the chart. 1. 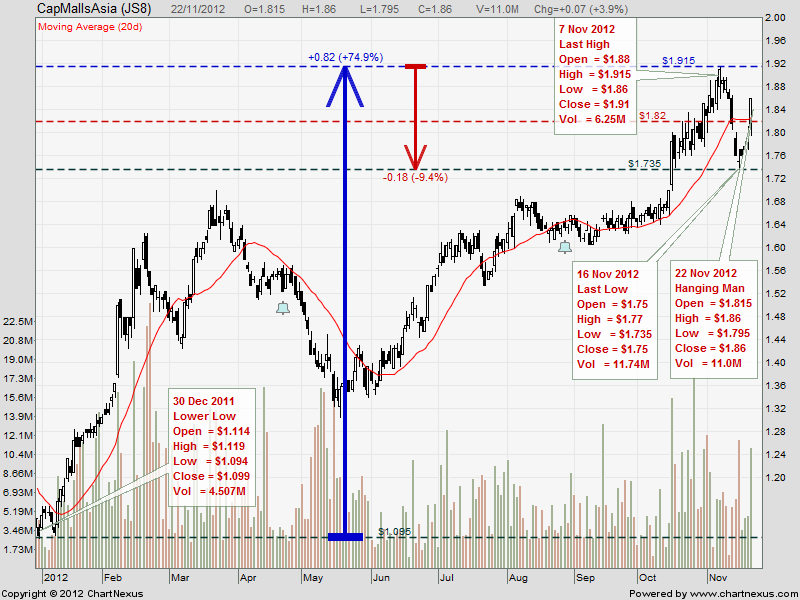 SMRT (weekly) chart pattern, rounding top, if support @ 1.53 breaks; TP 1.335. 2. Wilmar (weekly) chart pattern, rounding bottom + a handle = C&H formation, if resistance @ 3.92 breaks; TP 4.85. CORRECTION is over for these fellows? CapitaComm & SuntecREIT — Don't follow the crowd. 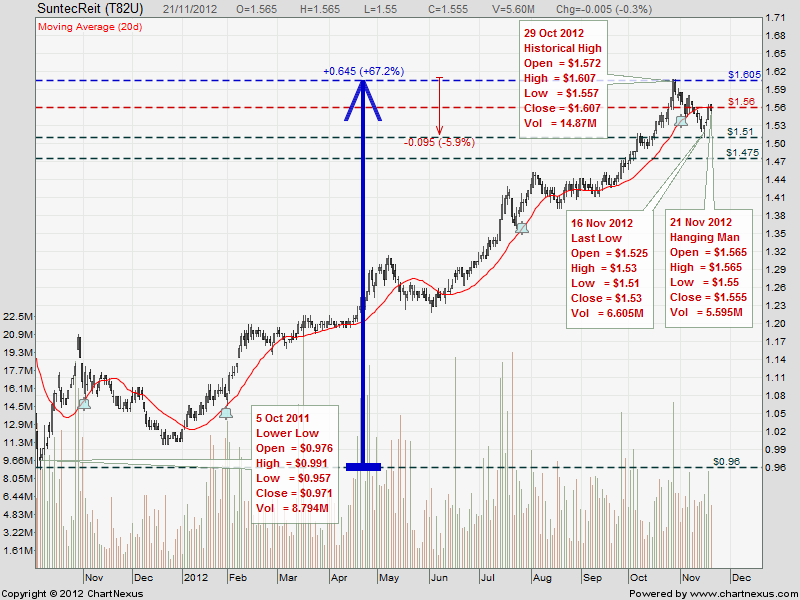 Why We Buy High and Sell Low — Based on TA, chart pattern on 21 Nov 2012 (ref. individual charts below), many SREITs prices had almost hit the peak then; retail investors would have been better off now 19 Mar 2013 if they did the reverse, i.e. SELL instead of BUY/Averaging down SREITs based on Analysts' reviews in Oct 2012. Good morning, notti Da Lole. Of the late, you realized CapitaComm and SuntecReit were behaving similar to one another - price no longer rebounce after hitting the 20dMA and/or lower Bollinger band. At this point, CapitaComm had broke her uptrend trendline which indicate a lower playing field is expected. For SuntecReit, once broke 1.67 price is expected to soften further. My two cents. I posted both versions earlier on DBS's chart dated 6 Nov 2012. I see the Deng Lang's version is more applicable to CapitaComm's chart now, mid-Mar 2013. CapitaComm hit high of 1.585 low of 1.54, now 1.555/1.56; last done 1.555 (-0.03, -1.9%) 18 Mar 2013 1135 hrs. 1. On 13 Mar, a long black marubozu closing @ 1.63 was a confirmation of a bearish symmetrical triangle breakout. (Dead Cross, 20d EMA crossed 10d EMA). 2. 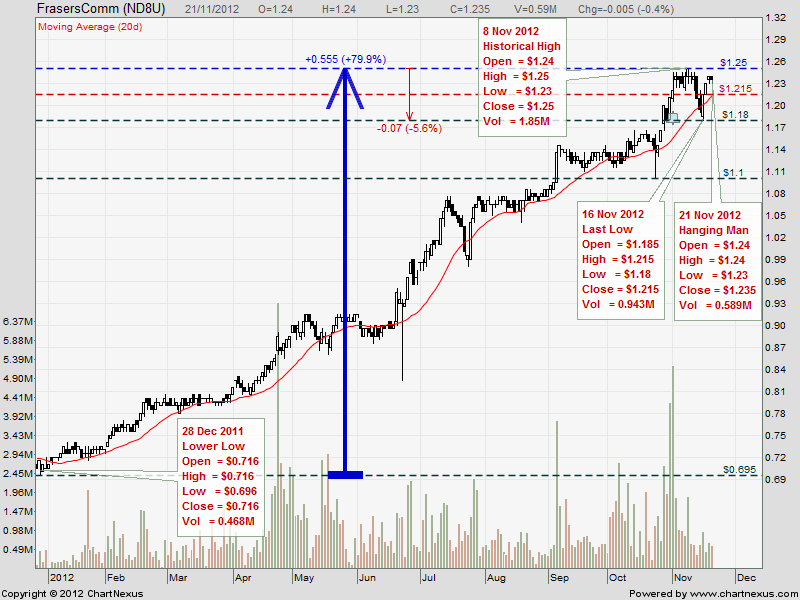 On 14 Mar, a long black marubozu closing @ 1.615 was a decisive signal/confirmation to short, not long. 3. 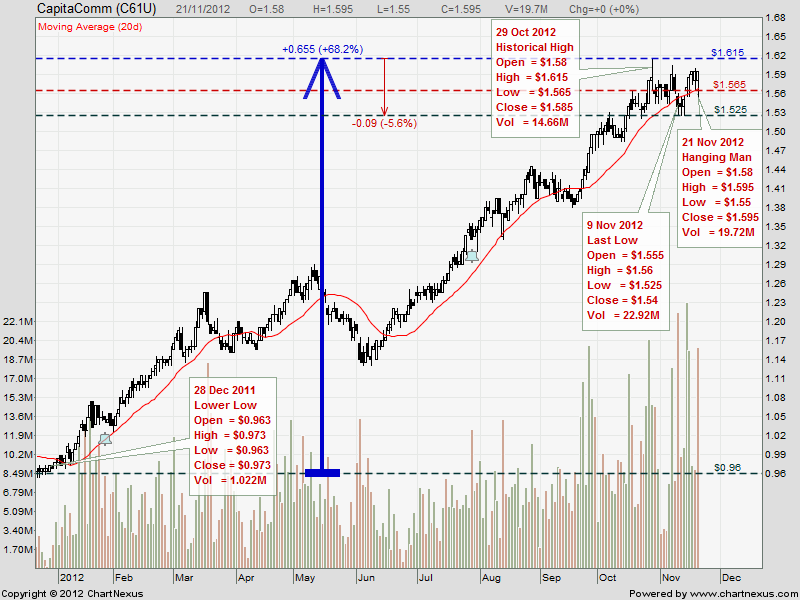 On 15 Mar, a three black crows closing @ 1.585 was a confirmation of a bearish rounded top breakout.